The 12-lead ECG shown in Figure-1 was obtained from a 50-year old man with chest discomfort. Are the findings seen suggestive of Early Repolarization — or something else? Figure-1: 12-lead ECG obtained from a 50-year old man with chest discomfort. NOTE — Enlarge by clicking on Figures — Right-Click to open in a separate window. ANSWERS: Assessment of the ECG shown in Figure-1 in view of the limited history provided (ie, a middle-aged man with chest discomfort) — is indeed a challenging task. 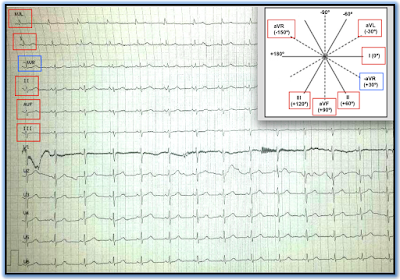 Practically speaking — a definitive answer to the question of whether the ECG picture in Figure-1 represents a normal repolarization variant vs early anterior STEMI (ST Elevation Myocardial Infarction) is not forthcoming from interpretation of this single tracing. Our Interpretation of Figure-1: The rhythm is sinus — with slight variability in rate (sinus arrhythmia). All intervals and the mean QRS axis are normal. Although QRS amplitudes are somewhat difficult to discern in some of the chest leads (due to overlap of complexes) — there does not appear to be ECG evidence for chamber enlargement (the R wave amplitude in V5 = 21mm + the 9mm S wave in V2 fall shy of the required 35mm threshold for LVH). Superficial Assessment of Q-R-S-T Changes: There are no Q waves. Transition occurs normally between V3-to-V4. There is no more than minimal ST elevation in leads I and V2. 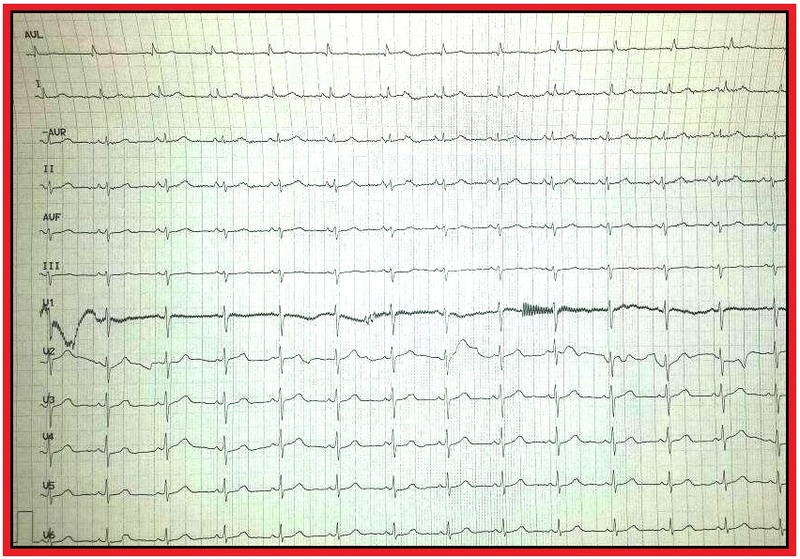 All T waves are upright (except in aVR) — and there appears to be no obvious ST depression. The shape of the upsloping segment of T waves in leads V2-thru-V6 is concave up (ie, “smiley”-configuration). More Discriminating Assessment of Q-R-S-T Changes: The patient is a 50-year old man with chest discomfort. This fact alone calls for far greater scrutiny in assessing Q-R-S-T changes than would be the case if the patient was asymptomatic. Although Q waves are absent and transition occurs normally between V3-to-V4 (since the R wave in V4 appears slightly taller than the S wave is deep) — r wave amplitude is decidedly reduced in V1,V2,V3. In this context — the T waves seen in leads V2,V3 appear to be disproportionately tall and peaked, with a rounder (fatter) T wave peak in V2 than should-be-expected given the relatively low amplitude rS complex in this lead. Closer scrutiny of the limb leads reveals that they are not completely “normal” as was initially suggested by superficial assessment. Instead, the ST segments in leads III and aVF appear flattened (despite the presence of upright T waves in these leads) — and the subtle-but-real 0.5mm J-point ST elevation in lead I might in fact be relevant. 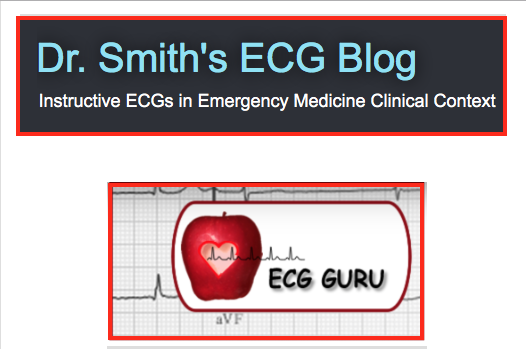 KEY POINTS: It is OK not to be certain about the clinical significance of a single ECG. This happens often. Awareness that early on, an acute STEMI (especially when anterior in location) — may be difficult to recognize is essential. More discriminating ECG assessment is needed in such cases. Reduced anterior r wave amplitude with taller-than-expected anterior T waves (especially if peaked T waves look broader than-they-should-be) should prompt more careful assessment of limb leads for subtle abnormalities. The finding of a longer-than-expected (albeit not necessarily prolonged) QT interval would add support to the possibility of an acute event. But even if meticulous ECG assessment does not suggest clear abnormalities — a patient with potentially worrisome symptoms of new cardiac onset should not be sent home until the provider can attain a comfort level that nothing acute is evolving. 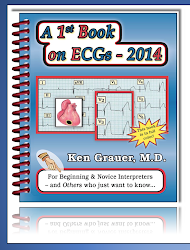 WHAT To DO: In addition to obtaining a more complete history and performing a careful physical exam — 3 interventions may be extremely helpful: i) Looking to see if prior ECGs are available for comparison (transmission from a distance being expedited if necessary by smart phone messaging); ii) Repeating the ECG as needed (since an acute evolving event may produce significant ECG changes in a surprisingly short period of time); and iii) Performing ECHO at the bedside (normal LV function in a patient with chest pain is reassuring — whereas localized wall motion abnormality suggests an acute event). 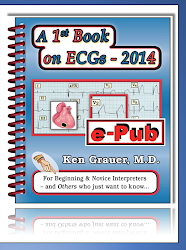 WHAT Happened: The ECG in Figure-2 was obtained just 8 minutes after the Figure-1 ECG. Is the diagnosis now more clear? Figure-2: Follow-up ECG obtained 8 minutes after the ECG shown in Figure-1. Interpretation of Figure-2: We doubt anyone would have predicted how emphatically the original ECG from Figure-1 has changed in as short a time period as 8 minutes! Sinus rhythm persists in Figure-2. There is now dramatic (>5mm) ST elevation in leads V2,V3 — with a lesser (but still very significant) degree of ST elevation in leads I,aVL and V4,5,6. Increased T wave amplitude and peaking is evident in leads V2-thru-V6, with hyperacute ST-T waves in virtually all of the leads with ST elevation. Small-but-real q waves now appear to be present at least in leads I, aVL and V6. In addition — there is now marked reciprocal ST depression in leads III and aVF. The combination of findings are strongly suggestive of acute LAD (Left Anterior Descending coronary artery) occlusion. There are now small-but-real new lateral q waves. In addition — the rSR’ complex seen in leads V2,V3 (just before onset of the marked J-point ST elevation in these leads) — probably serves as a “Q-wave equivalent” given slight-but-real loss of r wave from V1-to-V2 and obvious large ongoing acute anterior infarction. The subtle ST elevation in lead I and ST flattening in leads III,aVF from Figure-1 were indeed real findings that came before the obvious evolution of ST-T wave changes that are seen in these same leads in Figure-2. P.S. 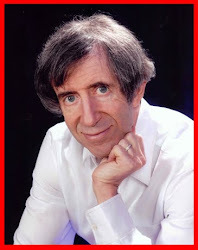 — While one may debate the pros and cons of routine high-sensitivity troponin assessment for all comers with chest discomfort — dependence on a first early troponin assay (with the term “early” referring to the time of the blood draw with respect to the time of symptom onset) — regardless of what the troponin result turns out to be (positive or negative) is unlikely to: i) Completely rule out the possibility of an early acute event (since early on, there may be false negatives … ); or ii) Be the deciding factor for determining whether or not the interventionist should perform immediate cardiac catheterization. Our bias is therefore that other factors (ie, clinical history and exam; initial and serial ECGs; stat Echo) are more important than the initial troponin value for determining whether a patient like the one in this case has an acute coronary occlusion likely to benefit from acute reperfusion therapy. ACKNOWLEDGMENT: My thanks to Haris Skrbo (of Capjlina in Bosnia & Herzegovina) for allowing me to reproduce this tracing and clinical case. How would you interpret the 12-lead ECG in Figure-1? This tracing was obtained from a previously healthy middle-aged woman who presented with back pain over the previous month. Does her ECG provide any clue to the etiology of her symptoms? HINT: Can you explain why the QRS complex in lead aVR shows global positivity (ie, positive P wave, QRS complex and T wave)? Figure-1: 12-lead ECG obtained from a middle-aged woman with back pain over the past month. NOTE — Enlarge by clicking on Figures — Right-Click to open in a separate window. 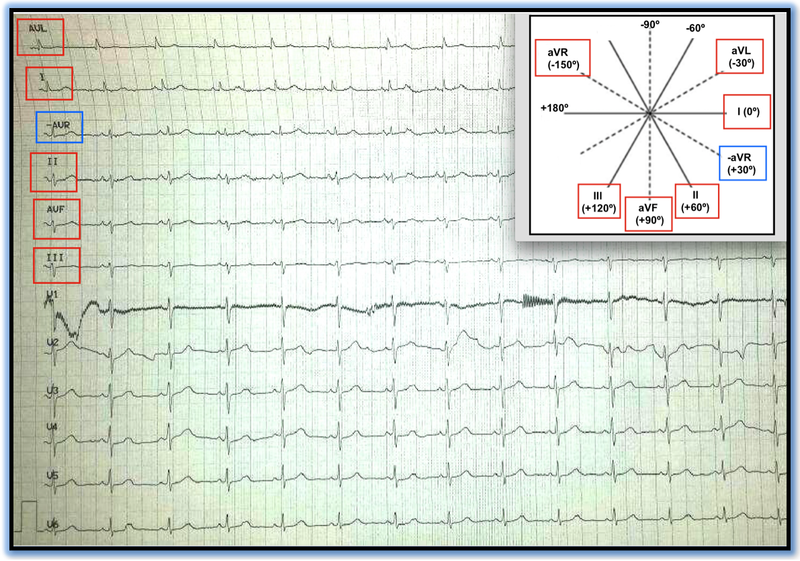 ANSWER: The ECG in Figure-1 provides no clue to the etiology of this patient’s symptoms. The reason the P wave, QRS complex and T wave are all positive in aVR, is that instead of the usual 12-lead format (that interpreters in the United States are accustomed to) — the Cabrera format has been used instead. 12-lead ECGs that are recorded in the United States typically display simultaneous recording of 4 sets of 3 leads (leads I,II,III; aVR,aVL,aVF; V1,2,3; and V4,5,6). One or more long lead rhythm strips are typically displayed immediately below the 12-lead. In contrast — Note that a simultaneously-recorded long lead rhythm strip for each of the 12-leads is displayed in Figure-1 — and, that the vertical sequence used for the limb leads is markedly different from the usual format. That is, rather than lead I — the first lead displayed is lead aVL. Note that a minus sign appears before the designation aVR (ie, -aVR). The reason for global positivity is that the polarity of lead aVR has been reversed. As a result — the mirror image picture (ie, global positivity rather than negativity) is displayed for –aVR. Our Interpretation of Figure-1: Unfortunately, there is some distortion of this 12-lead tracing, arising from the fact that this figure represents a smart phone photograph rather than a flat scan of the ECG. In addition, there is some baseline drift movement; interference artifact (the thick, vertical geometric lines most prominently seen in lead V1, with finer baseline undulations perhaps due to muscle contraction in several other leads); and other motion or improper skin-electrode contact artifact (seen best at various points in the long lead V2 rhythm strip). That said — the overall quality of this tracing is sufficient for appropriate interpretation. The rhythm is sinus at about 80/minute. The PR, QRS and QT intervals are normal. The axis is leftward, but not enough to qualify as LAHB (Left Anterior HemiBlock) — since the QRS complex in the long lead II is not consistently more negative than positive. There is no chamber enlargement. Regarding Q-R-S-T Changes — a small q wave is seen in lead aVL; Transition may be slightly delayed (the R wave only becomes consistently more positive than the S wave is deep between V3-to-V5) — but there are no more than minimal nonspecific ST-T wave abnormalities (slight flattening in several leads) that do not at all appear acute. 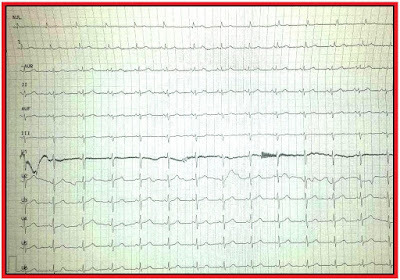 Thus, we find no explanation for this patient’s symptoms from her ECG that is shown in Figure-1. 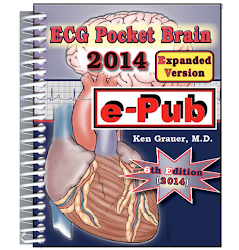 Electrocardiography has long been recognized as an essential diagnostic tool used across the world. While a similar display format (with no more than minor variation) is used for ECG recording throughout the United States — variations in format are used in many countries. Since many U.S. clinicians only rarely (if ever) see ECG recording formats that differ significantly from their own — these clinicians may fail to recognize other formats. 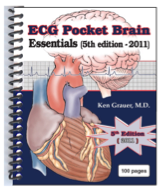 Given the exponentially increasing use of the internet for international medical correspondence (with now literally scores of international Facebook ECG forums) — plus ever expanding daily use of smart phone photographs for rapid remote consultation with experts regarding problematic ECGs — the clinical reality is that virtually all clinicians will from time-to-time encounter ECG formats that differ from the format they are most accustomed to. 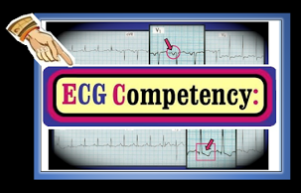 This clinical reality is my purpose for presenting this ECG Blog post. Illustration of the principal features of the Cabrera format is seen in Figure-2 — in which we highlight the vertical lead orientation (with blue and red rectangles) — and insert the Cabrera axis system in the upper righthand corner of the tracing. Note that vertical limb lead display begins with lead aVL — employs reversed polarity for aVR (within the blue rectangle) — and that each of the 6 limb leads are separated by the equal increment of 30 degrees in the frontal plane. Thus, lead –aVR is situated at a frontal plane angle corresponding to +30 degrees (in between lead I at 0 degrees — and lead II at +60 degrees). 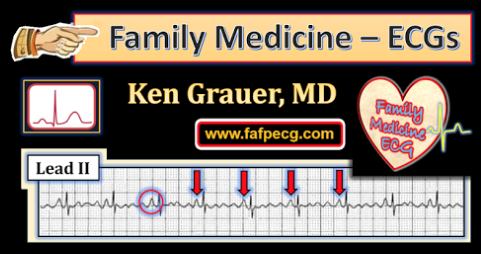 Figure-2: The 12-lead ECG from Figure-1 has been labeled, highlighting features of the Cabrera format. Note vertical limb lead sequencing begins with lead aVL — and that reversed polarity is used for aVR, with lead –aVR being situated in between leads I and II at +30 degrees (within the blue rectangle). Although first description of the sequential limb lead format shown in Figure-2 was made by Fumagalli (in 1949) — development of this format is attributed to Cabrera. The Cabrera sequential lead system for ECG recording has been in general use in Sweden since 1977, with current use in several other countries. In many ways, the Cabrera format offers a much more logical display of limb lead sequencing. As opposed to the traditional U.S. format (in which limb leads are grouped into standard leads I,II,III and augmented leads aVR,L,F) — there is gradually progressive (equally spaced) sequencing with the Cabrera format from lead aVL (at -30 degrees) to lead III (at +120 degrees). Using the Cabrera format enhances the clinical utility of aVR by effectively adding lead –aVR as a transition lead between lateral and inferior frontal plane location. 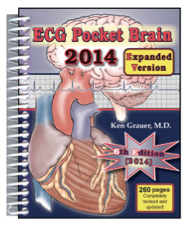 This allows greater specificity of the extent of high lateral and inferior ischemia or infarction. It also simplifies both axis and ST-T wave vector calculation in the frontal plane — since no more than a glance at the 6 sequential Cabrera leads is now needed for instant determination of which lead(s) manifests greatest net QRS and/or ST-T wave deflection. Finally, comparison with serial tracings in a given patient is easier — because sequential limb lead display makes serial variation in Q wave presence, QRS amplitude, and ST-T wave displacements much more evident as to what represents probable “real change” in patient status vs serial alteration in ECG waveforms primarily due to a difference in lead placement. Despite the above potential advantages of more logical sequential lead placement — the Cabrera format seems unlikely to replace the non-sequential traditional U.S. format, at least for the immediate future. Old established habits are difficult to break ... — even when a newer approach seems technically easy to implement and clinically advantageous. As a result — it is important for clinicians to be aware that their particular system of lead system recording is not universally used across the globe. ACKNOWLEDGMENT: My thanks to Alexandru Radulian (of Bucharest, Romania) for allowing me to reproduce this tracing and use this clinical case. Dower et al: Limb Leads of the ECG: Sequencing Revisited: Clin Cardiol 13:346-348, 1990. The 360 Degree Heart (Part I ) — by Vince DiGiulio — which illustrates (and emphasizes) the viewpoint of the flip (negative) image for the 6 frontal plane leads.